Satellite positioner with two axes of rotation. The satellite is integrated with an overhead in the vertical orientation, tilted down to horizontal and rotated along the longitudinal axis to provide ergonomic access to all sides of the space vehicle during assembly, integration and test operations. 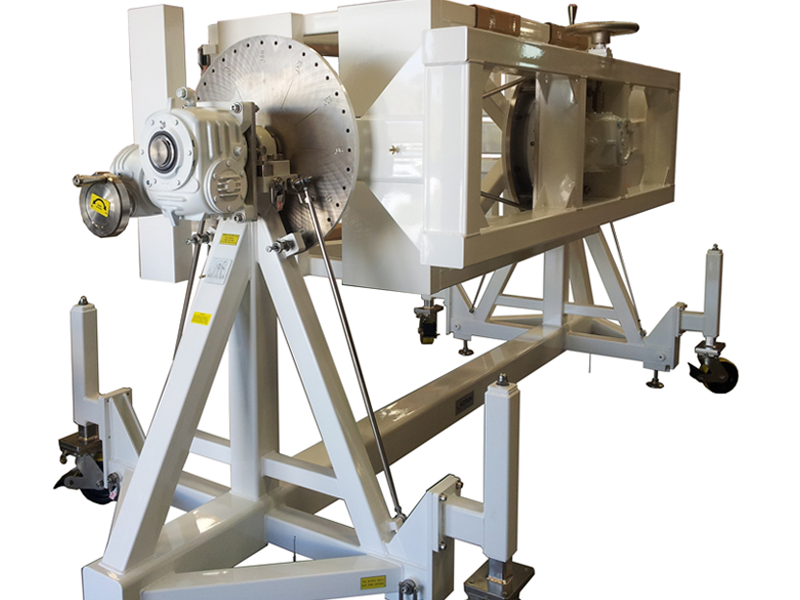 This Spacecraft Optical Test Fixture has two axes of rotation and a 2,000 lbs capacity. The rotational functionality of this two axis gimbal can be utilized for assembly, integration and test applications. Testing involves pointing an optical spaceflight hardware payload while maintaining optical stability. The optical stability requirement was verified by applying a three gram load to the most extreme corner of a payload test simulator and ensuring that the tool did not deflect more than 5 arc-seconds. Flotron was able to achieve this optical stability by eliminating the adjustment capability that is typically offered in our Off-The-Shelf product line (i.e. interface distance and height adjustment) and essentially fabricate a single weldment structure. Caster jacks lower this Pointing Fixture onto a set of leveling feet to provide a stable working plane. Lock rods and index locking features are rigidly attached between the frame weldment and the rotation axes to eliminate radial backlash and axial translation. Finishes and lubricants are compatible in an ISO 14644-1, (Class ISO 7) / FED STD 209E (Class 10,000) clean room spacecraft manufacturing environment. 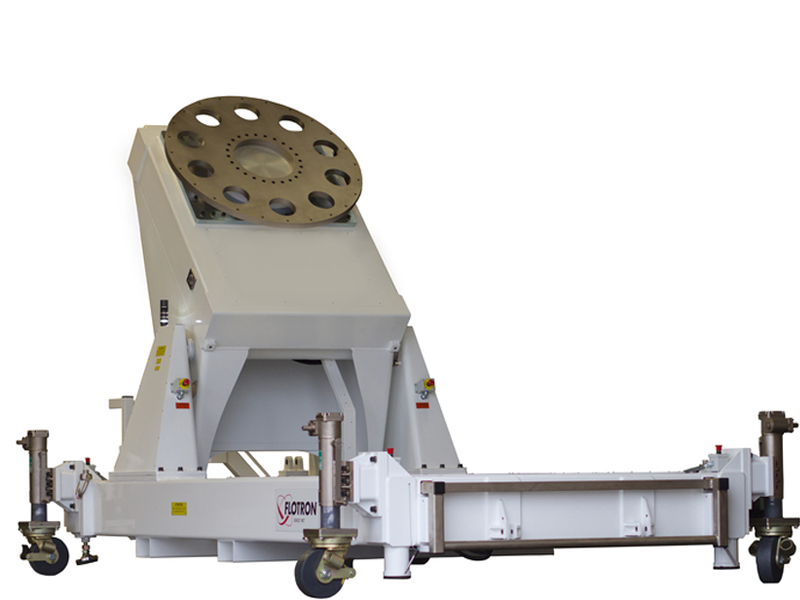 In addition to serving as a Cantilevered Rotation Fixture, this Custom Solution has lifting capability and a custom end effector that can tilt the payload to orient for testing. Stiffness and natural frequency requirements were considered in the design to prevent payload vibration during testing given the potential vibration loads imposed by the environment. 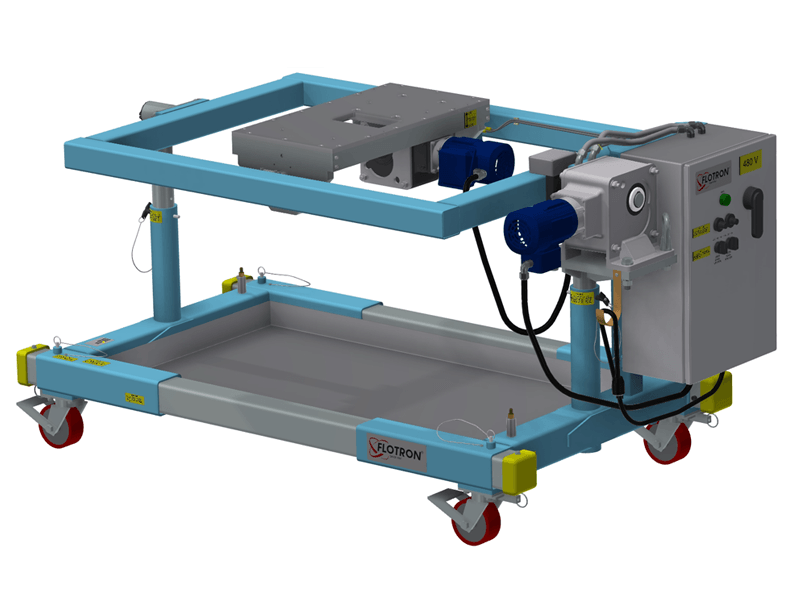 The caster jacks lower the RF Test Cart / Precision Alignment Fixture so that a series of three precision alignment tooling features seat in their respective floor mounted receptacles. A precision slide is then translated at the back to pivot this now Pointing Fixture (with payload integrated) and align for an RF testing application. The footprint of this Aerospace Tool had to fit into both the elevator and the lab environment located on an upper floor. 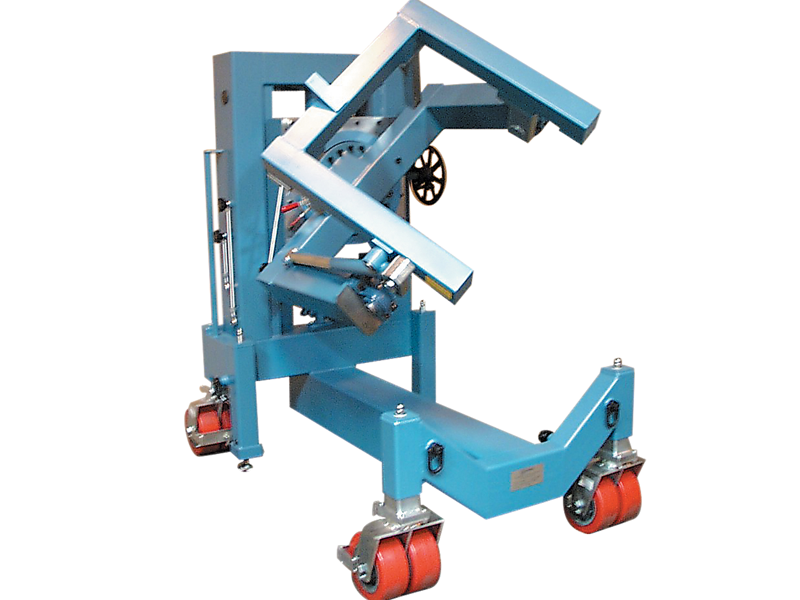 The large dual wheel casters keep the floor contact pressure to a minimum to meet the floor loading requirement. The SC2000-TR is designed to support small to mid-sized spacecraft in a cantilevered orientation. This spacecraft positioner tilts the payload from 0 – 90 degrees and rotates 360 degrees along the longitudinal axis. The SC2000-TR supports spacecraft assembly, integration, and testing operations. 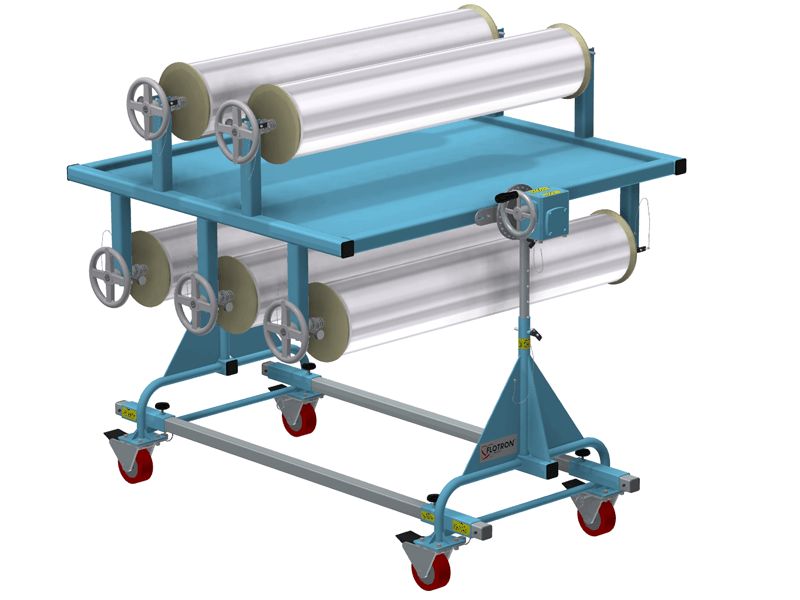 The tilt system utilizes redundant electro-mechanical actuators that are each capable of supporting the entire load. Rotation is accomplished through the use of a geared bearing and motorized non-back-driving gearbox assembly and both tilt and rotate functions utilize UL approved controls. Safety is considered first with multiple accessible safety stops, various operator presence sensing device options, limit switches, redundant braking, and audible / visual alerts, among others. Finishes and lubricants are compatible in an ISO 14644-1, (Class ISO 7) / FED STD 209E (Class 10,000) clean room spacecraft manufacturing environment. 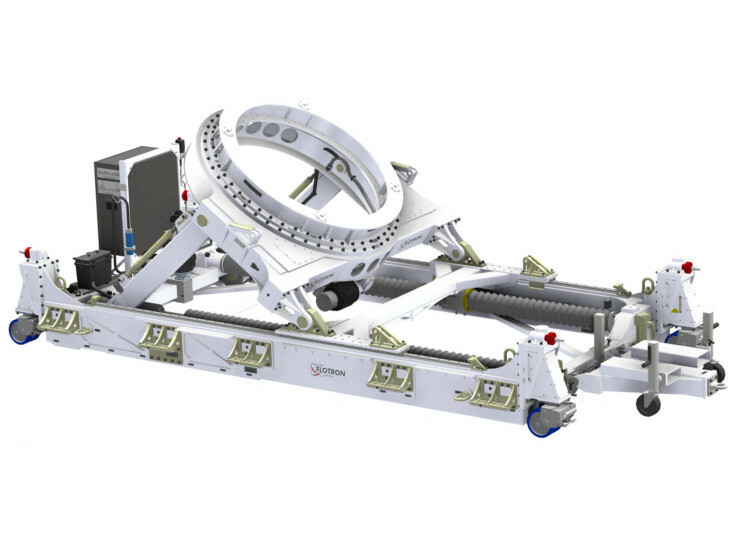 This motorized two axis rotation fixture with custom designed payload interface is designed to support an RF payload during assembly, integration and testing operations. We were able to utilize quite a few Off-The-Shelf components. In addition to providing mechanical rotate systems that are actuated using an input hand crank, Flotron offers Aerospace Tools with electro-mechanical rotate systems that are actuated with a pendant or control panel and have push button operation. Flotron incorporates UL approved controls and safety is considered first. There are multiple accessible safety stops, various operator presence sensing device options, limit switches, redundant braking, and audible / visual alerts among others. Multi-axis rotation fixture capable of rotating multiple composite cylindrical structures during painting and curing operations in an oven.